February 29 is a special day as it only comes around every four years. However, for Captain Marvel, February 29 holds special significance as it is the day he chose to be his birthday! 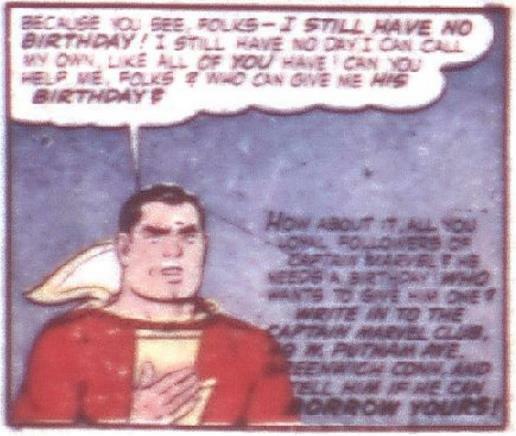 Captain Marvel had a birthday dilemma that began in the pages of Whiz comics #47. 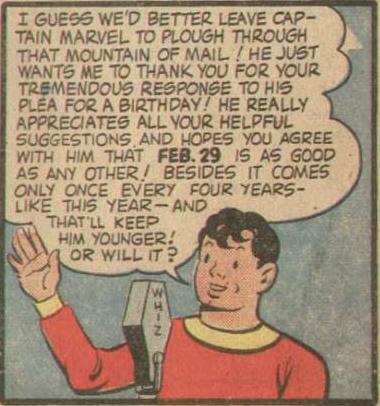 In this comic, Mr. Sterling Morris (Billy Batson's boss at WHIZ radio) is running for Alderman in what is proving to be a very tight election. Billy Batson isn't old enough to vote but Captain Marvel is! 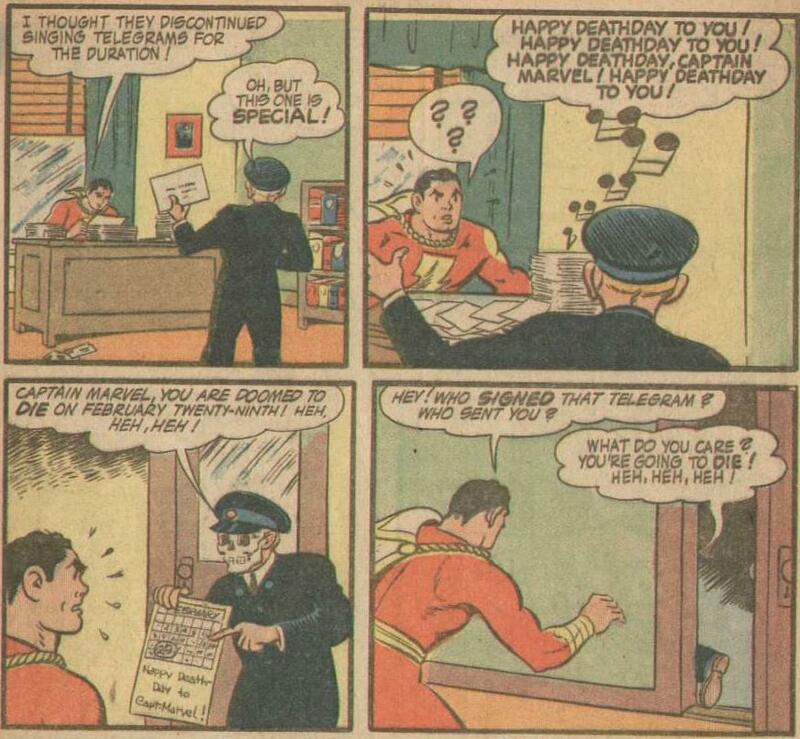 Captain Marvel intends to vote for Mr. Morris but then is stumped because he cannot prove or provide his birthday. Both Captain Marvel and Billy try all avenues to find out when Cap was born, but to no avail. At the end of the issue we see a forlorn Captain Marvel asking his legion of loyal fans to write in and let him know if he can borrow their birthday! Whiz comics #52 is where we find out what day Cap chooses as his birthday in the story, "Captain Marvel and His Death Day!" Dr. Sivana has determined that Captain Marvel will die on February 29, 1944 and disguises himself as a creepy singing telegram to let Cap know! Sivana has created a trap for Cap and finally lures him into it. But, as always is the case, Sivana's scheme is ruined and Captain Marvel is not killed. Sivana returns to his laboratory to find a note left for him from Captain Marvel. 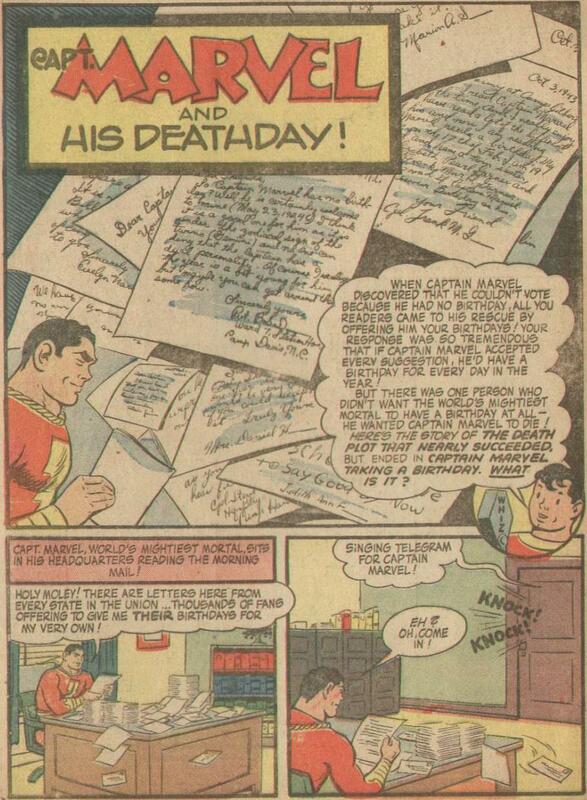 February 29 wouldn't be Captain Marvel's death day, but it will be his chosen birthday! 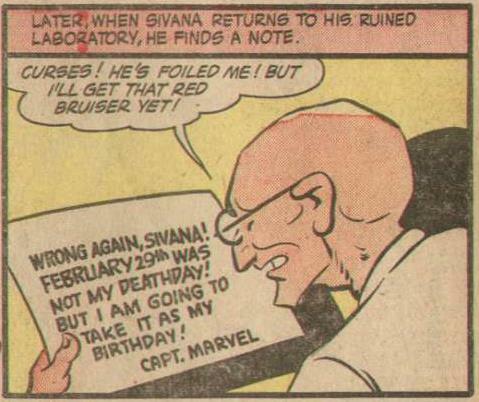 Captain Marvel had a dilemma about his birthday, and his loyal fans and loyal foe (Sivana) helped him choose February 29th as his birthday! Billy Batson Before the Thunder! The Death of Captain Marvel! Captain Marvel - Football Champion!